In this blog we will see how duplex network connectors work. In the previous part 1 we created a network connector from broker-1 and broker-2. We were able to see how messages for queue "foo.bar" on broker-1 were forwarded queue "foo.bar" on broker-2 when there was a consumer on broker-2 for queue "foo.bar"
Let's try doing the reverse by producing messages into broker-2's queue foo.bar and consume from broker-1's queue "foo.bar"
In the previous blog post, we had enqueued/dequeued 100 messages. Hence the #messages enqueued now shows as 200 here. As shown above, 100 new messages are enqueued on foo.bar queue on broker-2 but there are no consumers though there is a network connector for all queues from broker-1 to broker-2. The reason is that a network connector unless specified as "duplex" is unidirectional from the source to the destination broker. Let's change the following attribute highlighted in yellow in /Users/akuntamukkala/apache-activemq-5.8.0/bridge-demo/broker-1/conf/activemq.xml configuration file for broker-1. Let's restart the brokers and connect to the brokers using jConsole. Q:broker1->broker2 network connector is duplex. Q:broker1->broker2 network connector is "duplex". 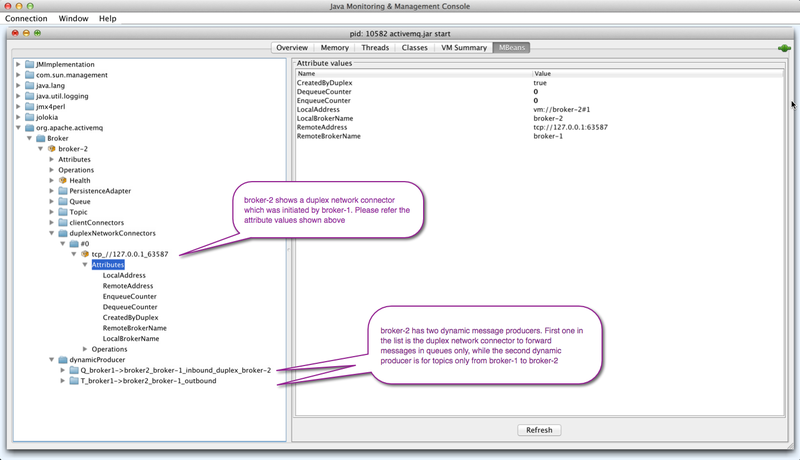 The following screenshot from broker-2 shows that all the 100 messages have been dequeued by a consumer (dynamically forwarded to broker-1). 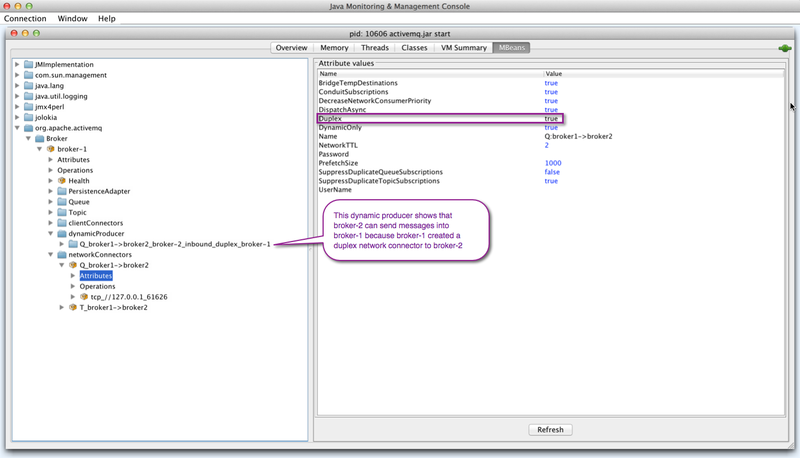 The following screenshot shows the details of this dynamic consumer on broker-2's foo.bar queue. This concludes part 2 of this series where we saw how duplex network connectors work.